Customs and import duties may be applied to International orders when the shipment reaches its destination. Such charges are the responsibility of the buyer and not included in the purchase price of your order. They vary from country to country. Contact your local customs office for details. Shipping laws are different in each country. It is your responsibility to check with your Customs office to verify whether the country to which you are shipping permits the shipment of your products. Sulphur Grove Tool is not responsible for any direct, indirect, punitive, or consequential damages that arise from improper international shipping practices. 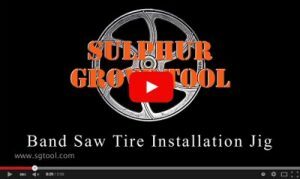 Sulphur Grove Tool charges sales tax for merchandise ordered on this Web site based on the applicable state sales tax rate and the location to which the order is being shipped. You may return merchandise for any reason for 30 days after receipt. Refunds will be given in the method used for payment. Sulphur Grove Tool reserves the right to change its refund procedures at any time without prior notice to you. Customers must get an RMA and return instructions from a Sulphur Grove Tool representative prior to returning merchandise. Returns must be returned in new and unopened condition. Returns are subject to a 50% restocking fee for damaged returns. Any machinery or items that are powered will have a 25% restocking fee.